Sled dogs just want to run at Sun Peaks Resort, B.C. 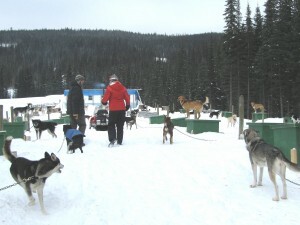 You are here: Home / Specialty Travel / Adventure / Sled dogs just want to run at Sun Peaks Resort, B.C. I slipped my fingers firmly around the collar, but was still unprepared for the bundle of energy that threatened to drag me to the sled at Mountain Man Adventures. Dogs were howling and pogo-ing on the roofs of their freshly painted, green dog houses throughout the snowy, outdoor kennel, crying out to be picked for the sled dog team. Only six got to go among a large number eagerly anticipating their turn. My attention was focused squarely on one dog—all I had to do was get the dog from his dog house to the sled and I was determined not to blow it. We were at Mountain Man Adventures, located near Sun Peaks Resort in Interior British Columbia. The snow in the Interior is light and dry, perfect for running dog teams in the woods. 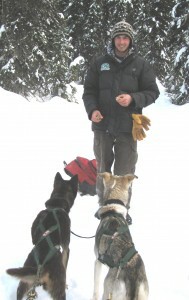 Chris Schwanke, one of the owners, showed us around the kennel and explained his philosophy. He acquired the kennel last year and has been working hard to socialize the dogs so they are comfortable being handled by different people. He wants people to understand how special these canine athletes are, and took the time to introduce us to every dog. Only one dog was still too shy to be petted but the others ranged from boisterously attention-seeking to quietly submissive to petting and back scratching. 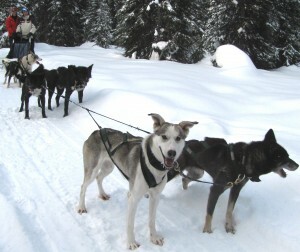 Dog sledding is an ancient northern tradition, for the Inuit and other aboriginal people depended on dog sleds for transportation across vast distances. It is thought that life in the Arctic would not have been possible without the synergy between man and dog. Evidence exists that dogs were used for hunting and transportation as long as 1,000 years ago. What a thrill to be able to get a taste of history in an afternoon. Having been dog sledding twice before we were prepared to drive the sled and hoped we’d be allowed to run the teams ourselves, even for a short distance. 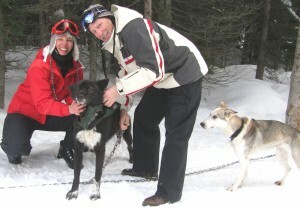 We were thrilled to learn that, at Mountain Man Adventures, every couple can run their own team, and even help harness the dogs. We’d never before had as much hands-on experience. Guests can choose their own level of involvement and can take a less hands-on approach if desired. Chris Schwanke, the owner of Mountain Man Adventures, had handed me a dog after asking if we wanted to hitch the dogs to the sled, and seemed to think it was perfectly normal for me to lead this heaving, compact mass of vigor, so I did my best to hang on, my husband laughing as he helped me with the chain. Together we slipped the harness over Puma’s head and gently pressed her paw through the loop. Chris encouraged us to rotate the harness as we had it upside down and things went a bit more smoothly after that. After repeating the process four more times we pretty much had it down, though I wouldn’t exactly call us pros. Chris demonstrated how to use the foot brake, described how to turn the sled by leaning one way or the other, mounted a snowmobile and left us in charge of the sled. What freedom! We loved running our own team, and appreciated the frequent stops Chris made at every major turn to make sure we were doing ok. The air was crisp and cold, the snow crunchy under the rails as the dogs loped across the white meadow. We leaned into the turns, ran behind the sled to help the dogs uphill and stepped lightly on the brake to keep the line taught as they galloped downhill as fast as they could go. Snacks were handed out at the half-way point, and chunks of frozen meat at the end of the trip as a reward. Our lead dogs, Rossland and Puma did a masterful job, and like many lead dogs, were calm, cool and collected while their team mates were going crazy, jumping and barking. Going up a hill, Puma turned and looked at me quizzically, and I knew it was time to dismount from the sled and help them up the hill. 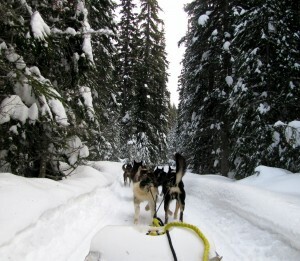 Comet and Coke, our wheel dogs trotted steadily, pulling the sled easily with their tails up happily. Marble and Star, our point dogs faithfully pulled in the middle position. Chris and Taryn offer two excursions, a 1.5 and 2.5 hour trip. A unique offering is a kennel tour, which is a great option if you’re not quite sure about dog sledding, or if you’re curious about how dog teams are trained and cared for. It is a rare pleasure to feel a connection with the past, and be able to actively participate in a uniquely Northern custom. Mountain Man Adventures provides a friendly and interactive kennel where visitors can experience the joy of working with the animals to drive the sled through a pristine forested environment. 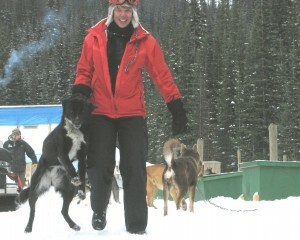 See related article on Yukon Quest Dog Sled Race. U.S. travelers can fly into Vancouver International Airport (YVR). From Vancouver connect on Jazz or West Jet to Kamloops Airport (YKA), rent a car or arrange for shuttle transportation. Sun Peaks Lodge offers a casual European-style hotel in the oldest building in Sun Peaks Village. Rates are reasonable, starting at $139 CAD per night. Call Central Reservations at 1-800-807-3257 for assistance in selecting a variety of lodging choices at Sun Peaks Resort. Support for this trip from Tourism Sun Peaks is gratefully acknowledged.